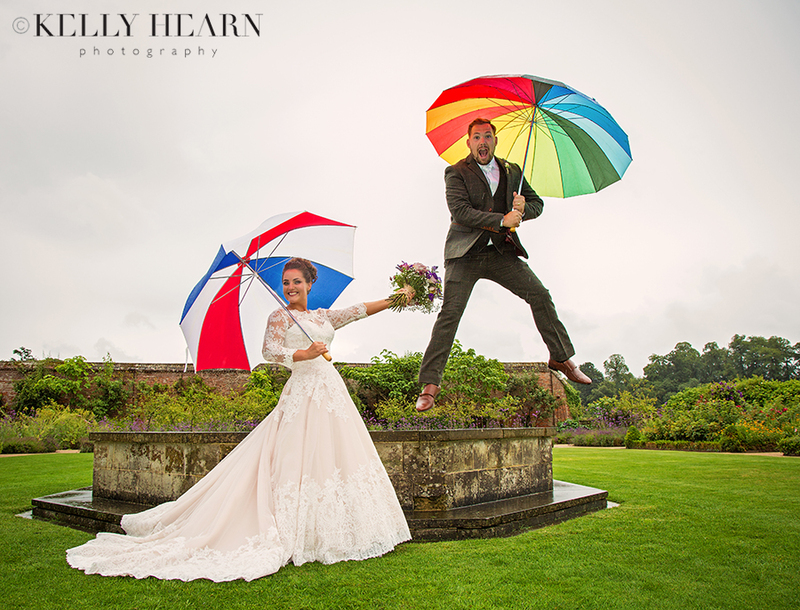 On a typical summer’s day in West Sussex, our changeable British weather determined that the Pearce wedding started in deckchairs and ended with umbrellas! Despite the summer downpour, it is a given that we English certainly don’t let a bit of rain spoil our fun and leading the way with their chipper approach and with beaming smiles, were our bride and groom, Jess and Dan. This lovely pair married in the stunning Southend Barns where it is easy to forget that the old dairy farm has suffered all extreme weathers in it’s time. Since new life has been breathed into the barns, restoring the original rustic elements whilst bringing in some fresh modern design, this versatile venue always manages to showcase a wedding beautifully whatever the weather. We found plenty of creative ways to capture Jess, Dan and their wedding party, utilising the variety of spaces on offer and maximising the flexible and stylish canvas of it’s chic interior. It was a July summer’s day when teachers Kate and Michael chose to graciously leave their sunny weather expectations at the door, so as to embrace the slightly grey rainy wedding morning that was dealt to them. These two had such an amazing outlook enabling them to welcome creativity and make the most of the drizzly circumstances and considering Kate and Michael were forced to change their outside summer ceremony plans, their flexibility to rearrange everything at the last minute was simply admirable. Highlighting just how much of a wonderful positive perspective they had, was also how they generously trusted me as their photographer to capture many amazing memories whilst in the most fun way possible! Despite the unreliable English weather, Kate and Michael certainly chose to see every moment that day as precious, which I believe was truly the key to the obvious joy they reflected in their images. 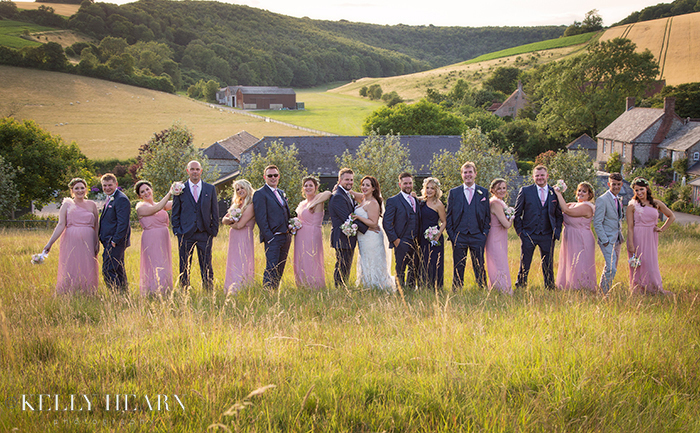 Vicki and Seb and their significant entourage made quite an impression as they decorated the vast hilly South Downs landscape in their midnight blue and blush pink wedding colour palette. The bridal party (all fifteen of them plus the bride and groom!) were in great spirits being photographed under the warm setting sun, whilst below in the glow of a bustling Upwaltham Barns, more guests were filling the charming rustic venue, expectant of a wonderful evening celebration ahead. Following what had been a beautiful day of heartfelt marriage vows, exquisitely delectable food and entertaining speeches, it was lovely to see Vicki and Seb swept up in the romance of the charming country setting and full of happiness at the end of a day rich with the love of family and friends that surrounded them.